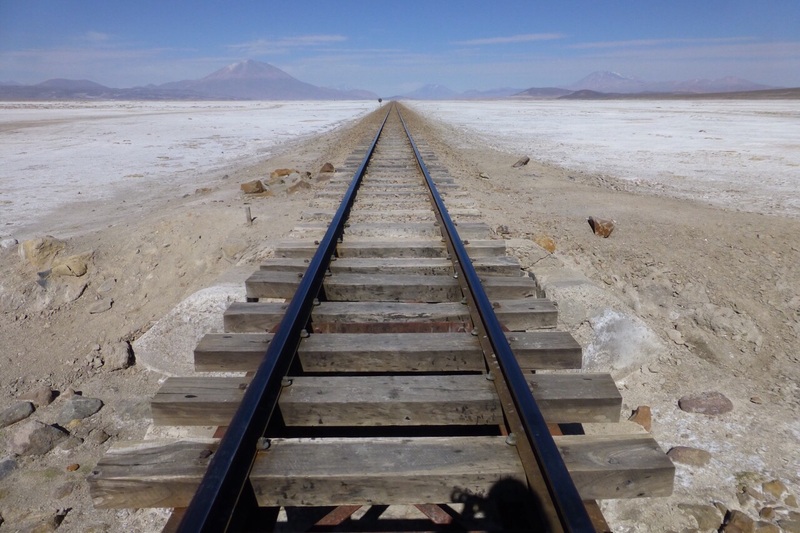 To take full advantage of my recent three-day weekend, I took a double-decker overnight bus to Uyuni, which is in the southwest corner of Bolivia. Uyuni itself is a small, sleepy sort of town, most known for being the gateway to the Salar de Uyuni (“salar” meaning “salt flat”), which is the world’s largest salt flat. At 4086 square miles, the salar is about 100 times larger than the Bonneville Salt Flats in the U.S. and approximately half the size of Belgium. That’s pretty darned big. Typically, visitors engage a tour operator to do a three-day “circuit” (which includes the salt flats and the Avaroa National Reserve), simply because it isn’t advised to go on your own due to the extreme conditions and the lack of resources once you’re out there. Given that I’ve been on my own since I arrived in Bolivia, it was nice to spend time with fellow travelers, who were made up of a jolly mix from Australia, the UK, Germany, France, and Switzerland. For some reason that I can’t quite explain (but for which I have theories), I run into very few Americans when I’m abroad. But I digress…back to the tour itself. We started by visiting an antique train cemetary, which is the rusted and decaying remains of trains that once carried minerals for the mining industry before they were abandoned in the 1940s. 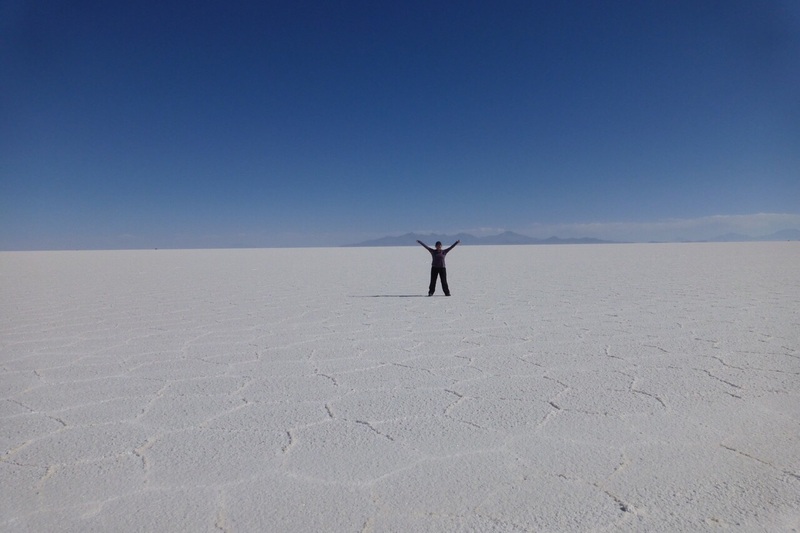 After, we headed for the infamous Salar de Uyuni, which is truly a geological wonder to behold. When I first saw it, I held my breath, then exhaled deeply as I took in the massiveness of it all—a blindingly white, salty sea of nothingness—like being upon a sea of ice, but without the cold (at an altitude similar to La Paz, it’s icy cold at night and warm when the sun shines overhead). The salar is the result of two prehistoric lakes that evaporated tens of thousands of years ago, leaving behind a thick salt crust that is over 30 feet deep at its thickest point and contains approximately 10 billion tons of salt. Underneath the crust is a brine layer that contains lithium, making Bolivia the owner of approximately half of the world’s lithium supply. The salar is also abundant in other minerals, such as potassium, magnesium, and borax—it’s a veritable sea of mineral riches. Within this sea are a few islands, one of which we visited after having some fun on the salar. The islands were actually submerged volcanos when the prehistoric lakes existed, then as the lakes evaporated, the tops of these volcanoes were uncovered. 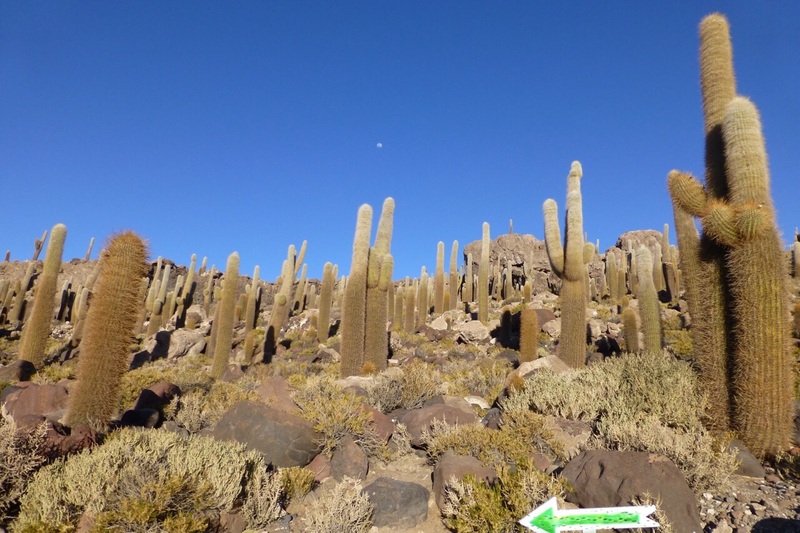 The result is a tiny land mass that is an interesting mix of volcanic rock and fossilized coral, topped with giant 1000-year old cacti, and nestled in a sea of salt. It almost sounds like something you can eat. After staying overnight in a hostel that was almost entirely made of salt (everything from the floor and walls to the chairs and nightstands), we spent the next two days exploring more of the salty wilderness and roaming throughout the Avaroa National Reserve. The reserve is an expanse of land that is as exquisitely barren as it is varied. There are volcanoes, deserts, and sulfur geysers (or as our tour guide pronounced them, “geezers”). There are swaths of rock formations of different varieties, some made of volcanic rock and fossilized coral, and some of sandstone, worn and shaped by the elements. There are vibrant lagoons that reflect the color of its contents, such as Laguna Colorada, which is red due to the algae and plankton that live within it; or Laguna Verde, which is green due to the heavy metals within its waters. Even the mountains are varied, with streaks of color that reflect the unique mineral composition of its soil and stone. It’s a harsh and unforgiving landscape, choosy about its inhabitants since only the hardiest can survive. 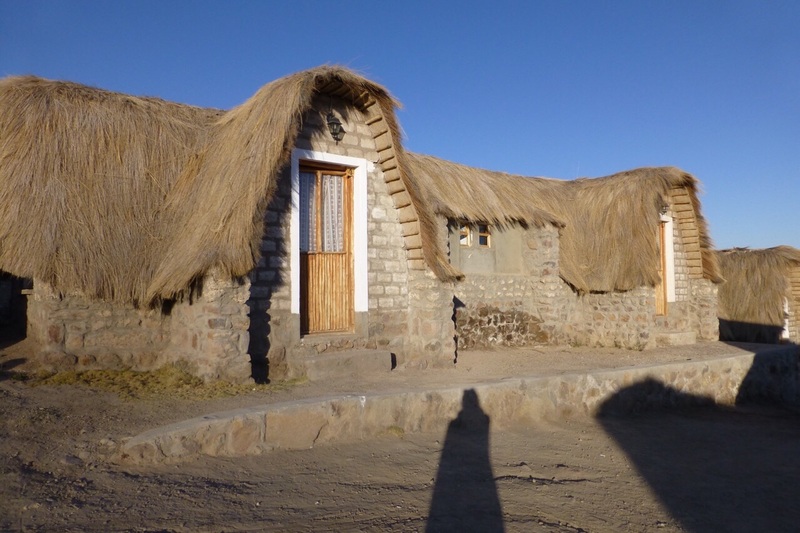 Among those that thrive here are various desert shrubs, the Andean fox, vizcacha (Andean rabbit), vicunya (a type of deer), and three types of flamingos. 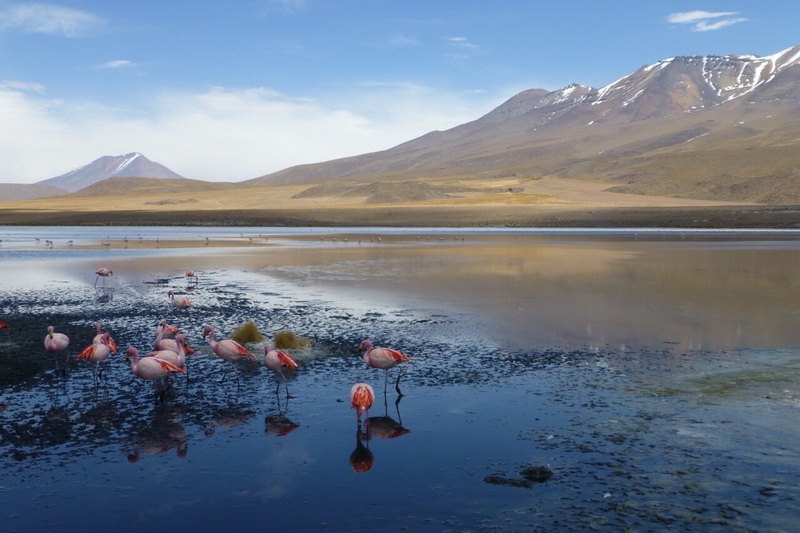 Interestingly, there are no fish or other marine life in the lagoons, so the flamingos survive on a diet of algae and plankton; yet, they still retain their pink hues despite the lack of shrimp in their diet. The entire circuit, from the Salar de Uyuni to the natural reserve, feels as though you’ve landed upon another planet—one made up of volcanoes, minerals, sulfur, and salt. To me, it feels only lightly touched by human hands, with no modern roads and tiny outposts of hostels few and far between. It was because of this that I found myself feeling melancholy as the tour ended. It wasn’t just because it was ending and I love being in the wilderness, but because I realized that everything I saw—everything that I regarded as beautiful and perfect in its own right—would change. I mentioned earlier that Bolivia sits upon a “sea of mineral riches”; however, it’s still one of the poorest countries in South America (up to 60% of its people live in poverty). In the past, Bolivia’s ability to mine its natural resources has been slow due to its desire to keep the operation in Bolivian hands and avoid foreign exploitation; however, its current President has big plans to change Bolivia’s fortunes by ramping up their mining industry to become a major provider of the world’s lithium—and that lithium is in the salar. *sigh* It’s something that I think about a lot when I travel: things must change in order to improve life for the people, but in doing so, what becomes of the wilderness? What becomes of the things that make a place unique? Obviously, I have no answers for this. All I can say is that I’m glad this place is here, I’m grateful for the opportunity to have seen it, and most of all: I hope it doesn’t change too much. We are leaving tomorrow on the same tour and your post made me even more excited! I am so glad! I hope you enjoy it as much as I did. Buen viaje!